TWO-THIRDS of people with diabetes have some form of heart or blood vessel disease. Such diabetics also tend to experience re-blockage of heart arteries following balloon angioplasty more often than patients who don't have diabetes do. Heart patients with diabetes are also more likely to have a heart attack within six to 18 months following angioplasty, and they have higher death rate following the procedure. 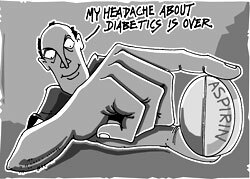 Therefore, any attempt to reduce such mortality would be of significant benefit to the increasing number of diabetics. Now, in the first study of its kind, researchers from the US report that giving diabetics with heart disease the so-called "super-aspirin" greatly reduces complications and death rates following a procedure called stenting. A stent is a small metal cylinder placed permanently inside a heart artery that has been weakened or clogged with fatty deposits called plaque. Such arteries are frequently opened with balloon angioplasty, but stents are widely used in addition to angioplasty to help hold the vessel open and to prevent re-blockage. Called abciximab, the drug keeps platelets from clumping and forming the blood clots that can obstruct blood flow and thereby trigger a heart attack or stroke. Such platelet blockers, sometimes called "super aspirin", though very expensive, are more potent than aspirin. This drug is administered in patients whom the physicians suspect is about to have a heart attack, like those complaining of chest pain. In such cases, abciximab can prevent thrombosis or clotting of blood and forming blood clots that can obstruct blood flow and trigger a heart attack. This study involved 491 diabetic patients who were divided into three groups. One group received both a stent and the super-aspirin therapy. A second group underwent balloon angioplasty and also received the drug. The third group had a stent implanted, but received no drug, only a placebo. One of the most surprising findings was that the re-blockage rate was cut in half in the patients who received both the stent and the drug. Those patients had an 8.1 percent re-blockage rate in the six months following the procedure, which is about half that of the other two groups. "The stent-abciximab combination brought the re-blockage rate in the diabetic heart patients to about the same levels as heart patients without diabetes. It's the first time this has been demonstrated," says Steven P Marso, lead author of the study and a fellow at the MidAmerica Heart Institute of St Luke's Hospital, Kansas, USA (Circulation Vol 100, No 25). Earlier studies have shown that abciximab reduces the heart attack and death rate in a variety of heart patients following balloon angioplasty. However, this latest study is the first to demonstrate that the drug combined with stent implantation reduces re-blockage of arteries specifically in diabetics, claim the authors.